From time to time, people say nice things about this blog. Sometimes not so nice. I've been informed today of a really fine form of flattery: the Iranian government has blocked access to the blog! They must be getting nervous about news from Tunis, Cairo, Tripoli and elsewhere. Everybody knows that it is impossible to effectively prevent the spread of information by internet. I'm told that in China during the Olympics the universities asked their students to sign an undertaking that during the Games they would not consult proxy (that is, illegal) websites that provided access to material that was otherwise blocked. When I tell people in China that I am concerned about access to the blog, they just smile knowingly and indicate that the information is accessible, but with difficulty. This must also be the case in Iran. The American Bar Association has developed a trial observation task force website, with much of interest about this important dimension of human rights monitoring. A few hours ago, the United Nations Security Council unanimously referred the situation in Libya to the International Criminal Court. Here is the text of the Security Council press release. The measure is likely to have an important deterrent effect on the crumbling regime in Libya. Even if Gaddafi himself is not chastened by the threat of prosecution, those that remain around him will be. It is a great development for the Court, but also a test. Now it must inspire confidence in its ability to provide a meaningful, significant and above all prompt response to the crisis. In the past, for example when the Security Council referred the situation in Darfur (in March 2005, Resolution 1593), the Prosecutor took nearly two years before laying charges. I think that something more immediate is expected. The people of Libya cannot wait two years for the wheels of justice to start turning. Let it be recalled that in 1999, as war raged in Kosovo, the Prosecutor of the International Criminal Tribunal for the former Yugoslavia, Louise Arbour, made an application for an indictment against Serb President Milosevic within a matter of a few weeks. And the Tribunal issued the indictment within a day or so, together with an order freezing his assets. This is the sort of urgency that the International Criminal Court now needs to display. Today's Resolution is significant because the United States voted in favour. In 2005, it abstained in the vote. But if the Security Council will move in this way given reports of devastating attacks on civilians, why did it not move in the same way the last time there were such attacks in the same region? I'm referring to Gaza and operation Cast Lead which took place only two years ago, and only hundreds of kilometres away from where Gaddafi is currently massacring his own people. On Friday, the Standing Committee of the National People's Congress reduced the scope of the death penalty in China by removing it for thirteen crimes, according to a report from Xinhuanet. The death penalty still remains applicable for fifty-five crimes. This is the first time that the number of crimes for which the death penalty may be applied has been reduced since 1979. The crimes concerned are all non-violent offences, and include smuggling cultural relics, gold, silver, and other precious metals and rare animals and their products out of the country; carrying out fraudulent activities with financial bills; carrying out fraudulent activities with letters of credit; the false issuance of exclusive value-added tax invoices to defraud export tax refunds or to offset taxes; the forging or selling of forged exclusive value-added tax invoices; the teaching of crime-committing methods; and robbing ancient cultural ruins. This reform is to be welcomed and it is a sign of changing attitudes within China. There is lots of evidence to suggest that absolute numbers of executions in China are declining to an important degree. This makes sense. China is simply part of a trend to lowering the death penalty in countries that retain it. The same can be seen in Singapore, Egypt and the United States. Gaddafi and the Special Court for Sierra Leone: Did UK let Gaddafi Off the Hook? David Crane is in the centre. From left, Robert Petit, Steve Rapp, David, Richard Goldstone and Andrew Cayley. I took the photo last August at the annual Chautauqua meeting of international prosecutors, past and present. It is taken outside the Robert Jackson Centre. Yesterday, a curious footnote to the work of the Special Court for Sierra Leone appeared in The Times, which I was reading by chance (it is not my favourite British paper, as readers of the blog will be aware) on the plane to Belarus, where I am delivering a lecture on the death penalty. Professor David Crane, of Syracuse University, who was the Chief Prosecutor at the Special Court of Sierra Leone between 2002-05, said: 'It was my political sense, dealing with senior leadership in the United Kingdom, United States, Canada, United nations, and the Netherlands, that this would not be welcome,' he said. 'This [Colonel Gaddafi's involvement]is not speculation on my part. We named and shamed him in the actual indictment. His view is corroborated by his colleague at the time. Sir Desmond de Silva, QC, one of Britain's leading barristers and an authority on human rights confirmed that Colonel Gaddafi's primary role in the war had been that of trainer and financier. Jack Straw, who was Foreign Secretary between 2001 and 2006, expressed surprise at the suggestion that the British Government had sought to influence the investigations. he said he had 'absolutely no recollection of knowing any involvement by the UK in putting pressure of any kind on anyone'. This is a rather stunning bit of news. If I were Charles Taylor's counsel, I'd be working on a new motion. The suggestion that the prosecutions at the Special Court of Sierra Leone were influenced politically, through threats to withdraw funding, is quite damning. I have always believed that the funding situation of the Court was totally unacceptable, and inconsistent with the independence and impartiality required of an international court (or any court). In effect, the Court has depended upon voluntary contributions from governments rather than relying upon the general budget of the UN, as is the case with the Yugoslavia and Rwanda tribunals. The suggestion that indictments are used to 'name and shame' individuals who are not actually prosecuted is an interesting one, about which readers of the blog may have some thoughts. I'm all in favour of charging Gaddafi (before the International Criminal Court) for recent atrocities in Libya. But for the record, I am not sure there is much of a case against him with regard to Sierra Leone. I served as one of the three international members on the Sierra Leone Truth and Reconciliation Commission, which worked during the same period that David Crane was Prosecutor of the Court. We did not find much evidence of Libyan responsibility, and nothing specific against Gaddafi. Our report indicated that young Sierra Leoneans had gone to Libya in the late 1980s for training. My impression was that this was more like summer camp for revolutionaries. During the 1990s, there was some evidence of financial support for the Revolutionary United Front from the Libyans, but we are talking about modest sums. For example, the Commission found a document whereby the RUF thanked the Libyans for a gift of $500,000. Small beer, really. And there were some reports of arms being transshipped through Libya. Of course, there is little doubt that Gaddafi supported the RUF. But to get a conviction at the Court, it would have to be shown that he knowingly participated in crimes against humanity or war crimes, and we found no evidence of that. 51. The Commission heard that Colonel Ghaddafi admitted supporting the RUF when he was confronted on the issue by Julius Maada Bio, the second Chairman of the NPRC, in 1996. Moreover Ghaddafi provided Bio with vital information and direction as to how to get the RUF to the table for peace talks. Ghaddafi’s counsel led – directly or indirectly – to the first peace talks between the Government of Sierra Leone and the RUF, which took place in Abidjan in 1996. Libya, which sent delegates to the peace talks, promised the withdrawal of its support to the RUF.70 The opening of those discussions was partly facilitated by the Special Representative of the Secretary-General of the UN to Sierra Leone, Mr. Berhanu Dinka. Following the general elections of February and March 1996, the talks that had begun between the RUF and the NPRC Government of Sierra Leone under Bio were taken up by the newly elected SLPP Government of President Kabbah. … 82. Liberia’s involvement in the conflict was part of a wider network of outside support for the RUF, which also involved Burkina Faso and Libya. However, there is no evidence before the Commission that Libya and Burkina Faso shared Liberia’s interest in the diamond resources of Sierra Leone. Although Libya had promised to withdraw its support for the RUF there are suggestions that following the coup of 1997, Libyan support for the RUF and its allies continued. Arms and ammunitions were flown from Libya via Burkina Faso and Liberia to the RUF.85 In a statement given to the Sierra Leone Police, Yair Gal (aka Yair Galklein), an Israeli “businessman”, testified that while travelling from Burkina Faso to Monrovia in December 1998, he witnessed the loading of rifles into an Air Burkina plane. The plane flew into Monrovia. Upon arrival the rifles were loaded into a Jeep, and driven to the border with Sierra Leone. 83. In December 1998 two Ukrainian planes loaded with arms and ammunition from Libya flew into Monrovia at midnight. The arms and ammunitions were then loaded into four trailer trucks belonging to Simon Rosenbloom, another Israeli. Three of the trucks went to Lofa country from where the arms and ammunitions were transported to the RUF base in Kono. The distinguished summer course at the Siracusa-based International Institute for Higher Studies in Criminal Sciences has issued its latest draft programme, and a final call for applications. The deadline is 15 March. The Irish Centre for Human Rights is one of the co-sponsors of the programme. The programme this year has a focus on Shari'a law, which seems particularly apt under the current circumstances. Among the speakers are two distinguished graduates of the Irish Centre for Human Rights doctoral programme: Roza Fajaeli and Mohamed Elewa Bader. Roza is now a lecturer at Trinity College Dublin, and Mohamed is a lecturer at Brunel University in London. There are fellowships available for students from developing countries. For more information. The European Journal of Legal Studies has a call for papers on the legal aspects of climate change. For more information. I've spent the last couple of days in Tunis, participating in a seminar on truth commissions and transitional justice organised by the Kawakibi Democracy Transition Centre. The seminar was focussed on the new National Investigation Commission into Violations Committed since 17 December 2010. This is the date when Mohamed Bouazizi set himself on fire in a gesture of outrage, frustration and rebellion, and it launched the events that Tunisians call a revolution and that have shaken the entire Arab world, and perhaps even further afield. Mohsen Marsouk, left, Taoufik Bouderbala, and Amine Ghali. Many countries wait years before undertaking transitional justice measures. In Sierra Leone, where I was involved with the Truth and Reconciliation Commission and about which I spoke today, the institution was called for in the 1999 Lomé Peace Agreement but it took three years to begin operations. In Tunisia, the Commission is already at work. In fact, there are three commissions. Another one, headed by Abdulfattah Amor or the UN Human Rights Committee, is charged with investigating corruption in the old regime. Today, the star of the show as Taoufik Bouderbala, who is president of the new Commission. He was accompanied by several members of the Commission. We also heard from Mohsen Marzouk, the eloquent and dynamic secretary general of the Arab Democracy Foundation and President of the Kawakibi Centre. When I arrived in Tunis yesterday, there were big crowds at the airport. These were Tunisians returning from neighbouring Libya. We drove past the Libyan embassy on our way to the hotel. I'm told the Libyan ambassador has resigned. There were crowds outside the Libyan embassy. At today's session we spoke at length about truth commissions and their relationship with the existing justice system. Tunisia has a very functional and professional justice system - unlike countries like Sierra Leone - but obviously it remains tainted by the regime with which it was associated. The new commissions seem an exciting way to help push along the democratisation process in Tunisia. I've been to Tunisia several times in the past. The atmosphere was always stifling because while foreigners could of course say what they wanted about human rights, we knew that terrible abuses were going on too, and from time to time we would hear that our Tunisian colleagues had been imprisoned. We would write letters to embassies, that sort of thing. How thrilling it was yesterday to get off the plane and breathe the fresh air of freedom. Now, I think the Tunisians also want to breathe the fresh air of justice. Previously, I have reported on the proceedings before French courts taken by an academic in the field of international criminal court against Professor Joe Weiler for a book review that she believed to be defamatory. I'd lost track of the prosecution, but there was a report on it in yesterday's New York Times. It seems the case was heard in January, and a judgment is expected in March. I've done a few rather critical book reviews in my time, but over the years have come to understand that there is nothing to be gained from writing negative reviews. My advice to reviewers is that if they can't say something nice, send the book back to the publisher or the journal. There is a corollary to this rule: don't believe everything you read in a book review! Shawan Jabarin, who heads the Palestinian NGO Al Haq, has been attacked by bloggers following his appointment to the Middle East Advisory Board of Human Rights Watch. I can do no better than post the fine response to these by Kevin Jon Heller on Opinio Juris. Judge Bert Swart has passed away. Bert was a distinguished academic who became an international criminal judge. Most recently, he was a member of the Trial Chamber of the Special Tribunal for Lebanon. Only a week ago, President Cassese asked the Secretary-General of the United Nations to designate a replacement, given Bert's lengthy illness. Bert studies law at the University of Nijmegen, the Netherlands, between 1959 and 1964, and the University of Poitiers, France, between 1964 and 1965. He was Professor of Criminal Law and Criminal Procedure at the University of Utrecht between 1980 and 1996. He has appointed Professor of International Criminal Law (Van Hamel Chair) at the University of Amsterdam in 1996, and I believe that he retired from that position only a year ago. Bert was a member of the Royal Netherlands Academy of Arts and Sciences. Before joining the Special Tribunal for Lebanon, Bert was an an litem judge at the International Criminal Tribunals for the former Yugoslavia and Rwanda. He served on the Trial Chamber in the Hadzihasanovic et al. case. Gabon, which held its last execution in 1989 and has been deemed de facto abolitionist for more than a decade, has now formally abolished the death penalty. Law 3/2010 was approved by the Parliament in January and promulgated on 15 February 2010, with the signature of the president of the Republic, Ali Bongo Ondimba, Prime Minister Paul Biyogha Mba and Justice Minister Anicette Nanda Oviga. According to the law, the death penalty is substituted with life imprisonment with the possibility of pardon or amnesty, conditional freedom or alternative means, only after having served at least thirty years of the punishment. The law also abolishes forced labour. A four-month consultancy for a specialist in trial monitoring is posted by the OSCE. Application deadline is early next week. Qualification, according to the notice, include ten years of experience in the human rights and rule of law area in general including at least five years of experience with trial monitoring, particularly developing strategies, methodology and training for trial monitoring programmes; an advanced university degree in law, human rights, rule of law, international criminal law or a related field; knowledge of international human rights law and particularly fair trial standards; excellent knowledge of English; excellent writing and presentation skills. The Liberian Truth and Reconciliation Commission made controversial rulings banning a number of individuals in the country from holding public office. These rulings have now been declared unconstitutional, according to a January decision by the country's Supreme Court. Please check out the new Youtube channel of the Irish Centre for Human Rights. At present, we have the two videos prepared by Mary Robinson and the late Kevin Boyle for the anniversary conference held in Galway last November. We expect to post lectures and commentary in the future. According to a press release, the Council of Europe has issued a series of T-shirts featuring articles of the European Convention on Human Rights. 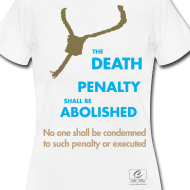 Here is the T-shirt on capital punishment. But you will not find this in the Convention! You have to look to Protocol No. 13, adopted less than a decade ago, to get to abolition of the death penalty. For the full catalogue, click here. The Chamber said he may be accompanied by counsel. He will be questioned first by the judges, following which the prosecution and the defence may examine (cross-examine?) him. Summoning of witnesses by judges is a relatively unusual event before the International Tribunals, although it is certainly not unknown. I am not aware, however, of judges of the Appeals Chamber ever making such an order. Perhaps readers of the blog can enlighten us on this. Bagosora had wanted Gatsinzi to testify for him at trial, but Gatsinzi had said he would only do so at the request of the judges themselves. No order was made. Bagosora says the testimony is important in terms of his appeal on issues relating to the fairness of the proceedings. Bagosora was convicted in December 2008 and sentenced to life imprisonment. He had been in charge of the Rwandan military from the outbreak of the genocide, in April 1994. The United States Court of Appeals, Second Circuit, in Kiobel et al. v. Royal Dutch Shell, has upheld a judgment from September 2010 ruling that the Alien Tort Claims Act could not be applied to corporations. The three-judge ruling, with one dissent, upholds the earlier judgment. For those who follow such matters, it contains an interesting reference to case law of the European Court of Human Rights (the legendary Soering decision). The court had earlier ruled (5-5) not to reconsider the case en banc, as the full ten judges. Ralph Steinhardt says it is the only circuit with such a ruling, and expects that case may now go to the Supreme Court. There is already detailed comment on the decision on the Oneworld blog and on Opinio juris. For the background of the case, see the Hague Justice Portal. The return of former Haitian dictator Jean-Claude ('Baby-Doc') Duvalier to Haiti has revived calls for him to be brought to justice. For years, Duvalier has been on the shortlist of former tyrants who had managed to escape prosecution, finding a comfortable retirement in a receptive home. In Duvalier's case, for many years this was France, the country that brought Haiti to its knees and kept it there for more than a century. 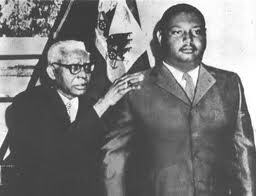 Since Duvalier landed in Haiti, I have been receiving calls and e-mails from friends and colleagues in that country asking about the possible legal difficulties involved in prosecution. A huge fog of debate has been created in Haiti by Duvalier supporters, who invoke a range of tired arguments in order to suggest that Duvalier cannot be punished, or that his liability may be limited to economic crimes. There is a strong case that Duvalier was responsible for crimes against humanity. Crimes against humanity, involving persecution and other forms of attack directed against any civilian population have been punishable under international law since Nuremberg. The precedents at Nuremberg linked crimes against humanity to aggressive war, and Duvalier's lawyers will have an argument that this limitation on the scope of crimes against humanity persisted until after he had left power. There has been no credible argument since the 1990s that crimes against humanity could not be committed in peacetime. There is much authority to suggest that the link between crimes against humanity and aggressive war had disappeared by the time of the Duvalier regime. I would not expect international judges to sustain an argument to the contrary. Apparently Haitian law does not contain a provision governing prosecution for crimes against humanity. This can be easily rectified by the adoption of new legislation. Could such legislation operate retroactively? Article 11(2) of the Universal Declaration of Human Rights says: 'No one shall be held guilty of any penal offence on account of any act or omission which did not constitute a penal offence, under national or international law, at the time when it was committed.' Thus, the test for retroactivity is not whether the crime existed under Haitian law at the time it was committed but whether it was part of international law. Nuremberg answers that question. The text of article 9 of the American Convention on Human Rights might be considered: 'No one shall be convicted of any act or omission that did not constitute a criminal offense, under the applicable law, at the time it was committed.' The reference to 'applicable law' rather than 'national or international law' is noteworthy. But the preamble of the American Convention cites the Universal Declaration of Human Rights. The Inter-American Court of Human Rights will consider 'applicable law' to include 'international law'. The Nuremberg precedent adopts that view that crimes of such horror were contrary to fundamental principles of humanity, and that the prospect of punishment for such crimes should have been known to the perpetrators. More recently, international case law takes the view that the accused person can only be punished for crimes that were 'accessible' and 'foreseeable'. Duvalier will have a hard time claiming that this was not the case with respect to the various acts with which he is charged during his regime. There can be no issue of immunity from the standpoint of international law. The International Court of Justice established that clearly in the case of Democratic Republic of the Congo v. Belgium, of February 2002. It confirmed that a state may always prosecute its own leaders. Some states have their own constitutional provisions on this, but it is something that can always be changed, even retroactively. There is also an issue of 'prescription' or statutory limitation. Haiti's criminal law provides for statutory limitation of various crimes. But since it has no provision for crimes against humanity, nothing in its law establishes a statutory limitation. It is well-accepted that crimes against humanity should not be subject to statutory limitation. Thus, it seems likely that some housekeeping in Haitian law may be required in order to facilitate prosecution of Duvalier. But Haitians should not be concerned that some legal loophole can shelter Duvalier from prosecution. All that is required, now, is some political will coupled with judicial energy. See the Li Haopei lecture by Judge Hans-Peter Kaul of the International Criminal Court, delivered earlier this week in Oslo, entitled: 'Is It Possible to Prevent or Punish Future Aggressive War-Making? ', as well as the related 'Policy Brief' prepared with judge Liu Daqun of the International Criminal Tribunal for the former Yugoslavia. Final arguments began in the Charles Taylor trial on Tuesday. The principal defence counsel, Courtenay Griffiths QC, was a few weeks late submitting the defense brief, and the judges refused to accept it. He walked out of the Court in protest. He returned later in the week to face possible contempt proceedings. But the judges have also decided to suspend the hearings pending the appeal by Griffiths of their decision not to accept the defence brief. I have difficulty understanding the logic at work here. To my mind, the logical reason for refusing the defence brief would be that allowing it would further delay the trial. But now the trial is delayed anyway, pending the appeal. It might also make sense for a court to make such a ruling where there is a systematic problem of late filings and where an example needs to be made. But this is the last trial of the Special Court for Sierra Leone before it goes out of business. The prosecution brief is already on the Court's website for all to read. I can't post an unredacted version of the whole defense brief because it contains confidential material. But I have obtained, for readers of the blog, the first portion of the defence brief - about 50 pages of it. I know that judges and their legal assistants occasionally look at this blog. Perhaps they can read the defence brief here, even if they don't officially admit it into the record. Surely they can only benefit, in their search for the truth, from consideration of the submissions of the defence. Two years ago, Georghios Pikis completed his six-year term as a member of the Appeals Chamber of the International Criminal Court. Judge Pikis, who comes from Cyprus, had been a member of the country's Supreme Court before his election to the Court. While at the International Criminal Court, he participated in many seminal rulings involving interpretation of the Rome Statute, often writing individual and dissenting opinions. From left, Prof. Carsten Stahn of the Grotius Centre, Silvana Arbia, Judge Pikis, President Song and myself. Judge Pikis has produced a book, entitled The Rome Statute for the International Criminal Court. Published by Brill/Martinus Nijhoff, the book was launched yesterday in The Hague in the new premises of the Grotius Centre of the University of Leiden, located above the Central Station. Judge Fulford and myself were speakers at the event. The event was sponsored by Silvana Arbia, the Registrar of the Court. In addition to an impressive cohort of international judges, several doctoral students from the Irish Centre for Human Rights were in attendance. Judge Pikis signing a book for Judge Odio-Benito, while Judge Kuenyehia looks on. The book is a marvelous addition to the literature, to be consulted systematically by students of the Rome Statute. One of the great features of Judge Pikis's approach is the freshness with which he considers the Statute and the other instruments. Many of those interpreting the Statute, including several of the judges, 'remember' what the drafters meant at Rome, and this colours their understanding of the various provisions. Not Judge Pikis. He takes a classic, traditional approach, reading the words for what they say and drawing the conclusions that seem correct to him. Nor does he seem concerned that his views may be unpopular. This is the last of his preoccupations. For example, Judge Pikis takes the view that a judge who has been a member of one of the other chambers cannot then be designated to the Appeals Chamber. After he left the Court, the Plenary of judges decided to do precisely that. He is also opposed to the idea that a member of the Presidency can sit for more than two terms. These are controversial issues at the Court. He calls the law as he sees it. He is a great judge, independent and impartial, rich with integrity. The book is up to date as of the amendments adopted at the Kampala Conference. Judge Pikis is enthusiastic about developing the jurisdiction of the Court with respect to prosecuting the crime of aggression. As a Cypriot, he is familiar with the phenomenon. It is to be hoped that Judge Pikis will continue to study the case law of the International Criminal Court. We will benefit enormously from his insights and opinions. Bert is the editor of Human Rights Quarterly, director of the Morgan Institute for Human Rights at the University of Cincinnati, and a distinguished academic in the field of international human rights. He has been a friend of ElBaradei since the early 1970s, when they studied together at New York University. Read Bert's entire article about ElBaradei here. It's the first great human rights dividend of the turmoil in Arab countries: Tunisia will abolish the death penalty and it will ratify several human rights treaties, including the Second Additional Protocol to the International Covenant on Civil and Political Rights Aiming at Abolition of the Death Penalty. The Council of Ministers of the transition government announced on the evening of 1 February 2011 that Tunisia was going to ratify the Rome Statute of the International Criminal Court, the International Convention for the Protection of All Persons from Enforced Disappearance, as well as the two optional protocols to the International Covenant on Civil and Political Rights. The second protocol concerns the abolition of the death penalty. In addition, the Council of Ministers has announced deliberations on the lifting of reservations against the Convention on the Elimination of All Forms of Discrimination against Women (CEDAW) by the Tunisian government. “This is unprecedented in the entire region, and this should well be emphasized”, says Khadija Cherif, General Secretary of the Fédération internationale des droits de l'homme. “However, we are still impatiently awaiting the lifting of reservations against CEDAW, as we would hope that these ratifications will enable the country to move forward and embrace the true safeguard of human rights of each and every individual”, she concluded. Tunisia's last execution dates to 1981, and the country has been deemed de facto abolitionist for some time. Abolition of the death penalty is a very important symbolic gesture when there are dramatic changes of political orientation in a country. Let us hope that Tunisia's example is followed by other countries. The new government in Egypt, when it replaces Mubarak, should demonstrate the importance of the change by abolishing the death penalty. My paper was on Katyn and Nuremberg. The Soviet prosecutor had insisted upon including the accusation in the indictment that the Nazis were responsible for the murder of 11,000 Polish officers and intellectuals in late 1941 in the Katyn forest, located near Smolensk. A Soviet commission of inquiry had investigated the mass grave once the German forces were driven out of the region and its report was tabled into evidence. The German defendants. who knew that it had been the Soviets who were responsible for the mass executions, insisted upon producing exculpatory evidence. In the final days of the great trial, Germans and soviets each produced witnesses to bolster their competing explanations. The judgment is silent on the subject. Even the Soviet judge said nothing in his dissenting opinion. My reading of the testimony, which is in volume 17 of the Nuremberg proceedings, is that neither side really did a good job of proving its version. The judges did the right thing under the circumstances. Among the interesting materials on Katyn and Nuremberg can be found the proceedings of the US Select Committee, which examined the evidence in 1952. Robert Jackson testified before the Committee. There is also a fascinating memorandum from the historian of the British foreign office. The Katyn charge is often invoked in the victors' justice critique of Nuremberg. It is not the only atrocity committed by the victors, of course. To Katyn, one can add the firebombing of German cities, the use of the atomic bomb at Hiroshima and Nagasaki, and other Allied crimes. None of these has ever been properly punished. I've been intrigued by this question recently, not only because of the historic dimension, but for what we can learn in terms of prosecutorial decisions before our modern-day tribunals. In reality, the same types of problems remain with us. Personally, I do not attach validity to the charge that Nuremberg was flawed because it only prosecuted one side of the conflict. I will develop these ideas more thoroughly in my paper, which will be published along with the other proceedings at the conference later this year. One of the big debates at the conference was the appropriate legal characterization of the Katyn massacre. Many of the participants were anxious to pin the label genocide on the killings. The argument here is quite a stretch, in my view, but readers of the blog can consult the whole debate in the videos of the proceedings and in the published version, when it appears. Much attention was given to how the Katyn case might be litigated today. Currently, there are at least two cases pending before the European Court of Human Rights directed against Russia. hastily called internal meeting this morning with FCO Permanent Under Secretary Peter Ricketts, FCO senior officials reportedly determined to send more "nuanced" instructions to their mission in New York. While there is "no way the UK will be on a forward footing," FCO contacts report HMG may be willing to be "flexible" if the Government of Sudan makes serious efforts to improve immediately the situation in Darfur. That said, top FCO Legal Advisor Daniel Bethlehem is reportedly "nervous" that there may be very little legal space for the UK to remain flexible for long. ¶2. (C/NF) UK officials plan to seek ministerial advice on UK-Sudan policy in light of the indictments on July 15 at a Cabinet-level meeting on Africa, after the ICC Prosecutor announces the new indictments on July 14. Among UK officials, there is growing skepticism that a Bashir indictment will actually be an "apocalyptic event," even if it could cause drastic damage to the UK's current policy of engagement with Bashir's regime in Khartoum. Classified By: Political Minister Counselor Richard Mills, reasons 1.4 (b/d). (CPA) and the Darfur political process while also maintaining HMG credibility in support of the ICC. to spur CPA implementation. End Summary. adopting a hard-lined approach in support of the ICC. There is no current movement to pursue an Article 16 suspension of the ICC's investigation of Bashir, a "card not to sell cheaply." Ministers said there would have to be significant movement on both CPA and Darfur to warrant a move on Article 16 and the UK should try "to use intelligently the political space created by the ICC announcement," in concert with the U.S. and France. ¶4. (C/NF) In a July 14 meeting between Sudanese Foreign Minister Deng Alor and the UK Ambassador to Sudan, Alor said the GoS Council of Ministers had met on July 13 to determine its response to Ocampo's request for indictment of Bashir. Alor said Bashir was "surprisingly calm" and that the Council agreed to engage legally with the ICC; to work for a rapid broad-based solution to the conflict in Darfur, including establishment of a Truth and Reconciliation Commission; and to work for a united position with other political parties to promote national reconciliation and help turn the indictment into something positive. At the meeting, First Vice President Salva Kiir reportedly agreed the SPLM would remain in the Government of National Unity and work with the NCP to address the crisis caused by the ICC announcement. The two parties agreed to establish a joint crisis management  committee, chaired by Kiir and to include Second Vice President Taha, Foreign Minister Deng Alor, and the Ministers of Justice and Information. Sudanese to engage the Court. End  Note.) Other UK reporting indicates that the SPLM has been trying to engage the NCP on creation of a Roadmap on Darfur in consultation with other political parties and civil society. constructive and cordial." Bashir made his usual refrains about the Sudanese not receiving the deliverables promised by the international community in return for signing the CPA (i.e. removal from the U.S. list of state sponsors of terrorism, etc.) and about the UK's one-sided policy in support of Darfur rebels. Miliband underscored the need for political settlement of Darfur and stability in the South so that HMG could spend its time and resources on development rather than humanitarian assistance. On the CPA, Miliband welcomed the Assessment and Evaluation Commission's adoption of the mid-term report and emphasized the need to begin work on long-term issues like oil wealth-sharing. Both Bashir and Alor were reportedly positive about the progress on the Abyei Roadmap, but noted that there were still problems in deciding the top posts in the interim administration. ¶8. (C/NF) Miliband said the GoS should work with the newly appointed UN/AU Chief Mediator to bring about a new dynamic to the Darfur political talks, even though the rebels remained fragmented and hesitant to engage. He also highlighted the need to engage civil society and all Sudanese political parties in development of a common platform on Darfur in the run-up to the 2009 elections. ¶9. (C/NF) Miliband privately raised the ICC with Bashir in a one-on-one meeting to communicate the urgency for the GoS to engage the ICC, encouraging Bashir not turn his back on the international community.